Increasingly our phones are becoming a hub for our whole digital lives; be it ordering a new dress from eBay, feverishly checking social media accounts, or dissolving into the flashing colours of King’s new saccharin drenched candy crack offering, they are very rarely out of our sight. With all this additional functionality the phone’s basic function (making phone calls for all of you that have forgotten) has become secondary, and an often overlooked advantage of our minicomputers. The advantages of being able to instantly speak to someone anywhere on the planet is something that we felt weren’t capitalising upon in how we approached digital marketing for mobile devices, so we decided to test a theory out on one of our clients and bring phone calls back from the dead. 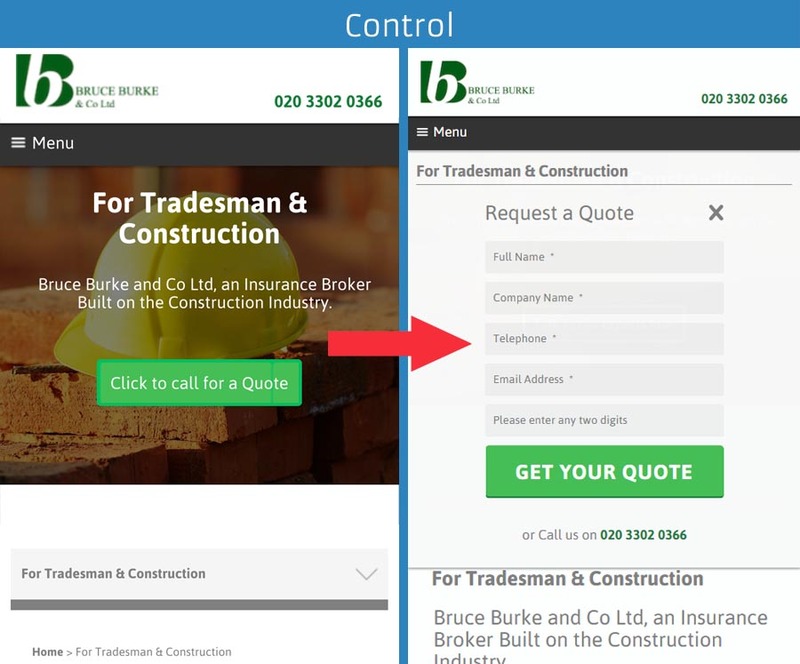 A specialist construction industry insurance brokers, Bruce Burke generate a great deal of new leads through their website – either through managed PPC campaigns or organic search results. Having developed a new website for them, we have been monitoring analytics reports and finely honing their digital presence, content strategy and marketing for the last 9 months, and have seen some excellent results in terms of lead generation. Whilst the calls-to-action (CTAs) that we have implemented on the desktop website have garnered excellent results, we weren’t seeing a great deal of traction on mobile devices. With 40% of their web traffic coming from handhelds, we figured that finicky fumbling of forms on phones was probably the reason for this. We decided that the best thing we could do was to make the CTA on mobile devices instantly call Bruce Burke, bypassing the boxes that they had to fill in. 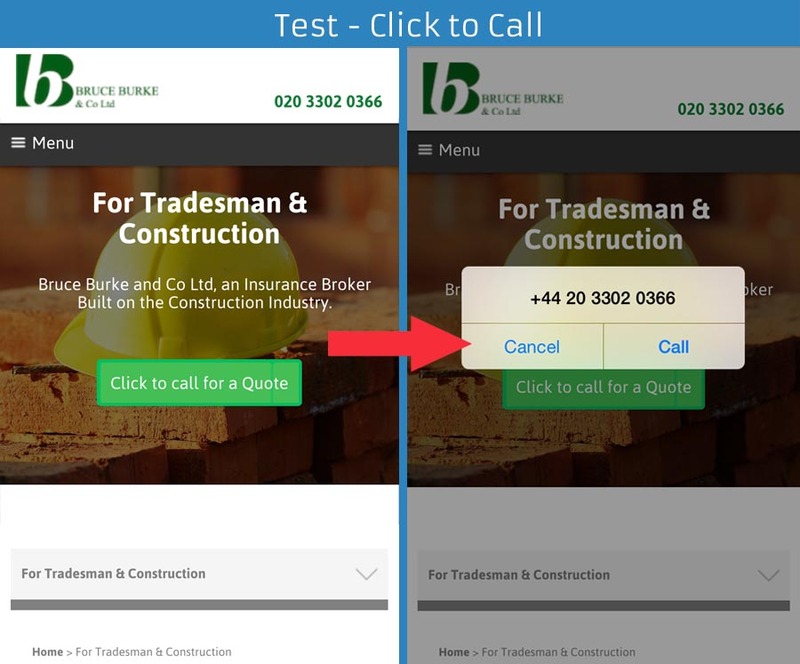 Alongside the text, “Click to call far a Quote”, the CTA was placed at the top of the screen, becoming instantly visible as soon as the page loaded and prompting users to simply get in touch. Whilst it may seem a little alien to put the phone to your face and speak into it, as a direct result of our implementing these changes we have seen the conversion rate of mobile users leap from 2.69% to 9.26%, generating 3.4 times more leads for the company. If that doesn’t make you want to call us, then what will?